We have our first sucker…I mean…brave and generous soul. Haley, the human, has come with an open mind, willing heart and a passionate desire to do her very best by her horse, Flecha. If anyone steps on her courage, even so much as a baby toe, I’ll rip them a new one…with a spoon (because it hurts more). Haley has also offered to take all the input she gets from us, document her rides, and then do another video in about three months so that we can see her and Flecha’s progress. How cool is that? Contact, Roundness and Correctness: What am I doing wrong? How do I set my horse up for success? I’m Haley, and this is my young mare, Flecha. I’m currently training her in dressage and hoping to take her to a show mid-May. We’re staying at intro level for now. I want to move up to training level in the next year, but of course, I think we have some serious work to do before we get there. Hence, crowd-sourcing The Hooves blog! I would rate this video of the two of us as “okay”. Then again, if she and I were perfect, there wouldn’t be much to evaluate! I think the video demonstrates both some good, soft movement, and also some pretty resistant moments (especially through her transitions). Right away I can see weaknesses in my riding that I need to fix: hands too low/uneven reins, rounding at the shoulders, and tenseness in my hip and leg that prevents me from following her trot. After making this video and reviewing it, I had a session with my trainer and made a serious effort to pick up my hands, sit up straight and relax my seat. These are things I technically KNOW I should be doing all the time; it’s not until I saw myself on film that I realized how often I lose my riding form! A real eye–opener. As for Flecha, I can see how much we have to work on in terms of 1) forward and 2) stretching. Two days before this video we had a riding session where I kept her on a long rein and pretty much all I did was ask her to stretch down and hop over some trot and canter poles. Flecha was VERY happy that night. But in this video, on a shorter rein? Not so much. Could the trick be to put in a month or so of riding in a longer rein and then gradually increase the time we spend on a shorter rein? This is where I wonder about the physiology of roundness and being on the bit. Is it too physically demanding for her? Or am I confusing her by riding ineffectively? I realize there are probably a myriad of different factors influencing this, so I’m very thankful to have some experienced horsepeople look at this video (and Flecha!) and help me help my horse. Here’s some info about her to help complete the picture. Flecha just turned 5 in March. Her father was a young stallion with a gelding appointment scheduled, but who still managed to cover the two mares he was inexplicably living in a field with. Later, all three of them came under the ownership of my barn manager, who quickly surmised the two mares were pregnant. One foal she sold right away, the other was Flecha. In spring 2009, the barn manager asked me if I’d like to adopt her, and being 20 years old and a little dumb, I said yes. Fortunately Flecha was easy to start (under saddle about a year and a half now) and is a smart, sensitive sweetheart. I think that with more time and physical conditioning, she could be a nice dressage horse. She’s about 15.1 and lives in 24-hour turnout. When she runs and plays in the field, she spends a lot of time with her head up, looking around like a telescope; so yes, staying low and round probably doesn’t come easily to her. Conformationally, the greatest fault I can see is that she’s over at the knee. I’m sure more experienced eyes can see other issues that might be affecting Flecha’s way of going. She also used to have pretty square, balanced halts, and now tends to halt with her right hind stretched back (you’ll see in the video). She was diagnosed with mild EPM last fall, which was cleared with a round of treatment. Since then is when she started camping out that right leg. Correlation? Causation? Not sure. She is otherwise sound to the best of my knowledge. I ride about three times a week on average, and probably we’d be farther along if I could ride her every day and see a trainer more than once every two weeks. But this is what my budget and gas costs (I drive about an hour to the barn) can handle. Maybe someday I’ll be able to ramp things up. I love her and want her to be calm, interested and willing in her work. Any advice on how to get her there is much appreciated. Thank you all! I’ll start us off since Haley originally contacted me for an article on the topic before I asked her if she’d be a guinea pig for the blog. 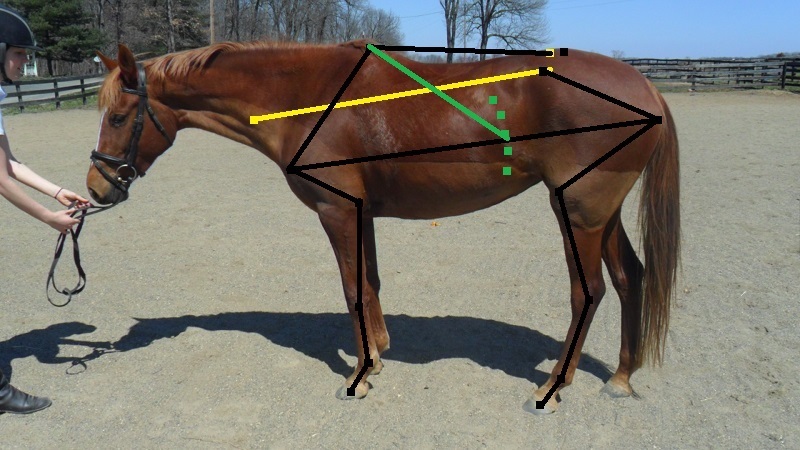 It’s important to start by knowing what we can expect from the horse in terms of athletic potential, as well, what areas we might expect to encounter resistance or difficulty. The LS joint would be better served if it was located further forward in line with the point of hip, however, Flecha possesses a good length of hip to help compensate. She loses a bit of coiling ability, but that nice length of hip, and the fact her femur is as long as her tibia (and I believe her hind limb angulation is at least adequate)…the LS joint placement isn’t a deal breaker and the potential for engagement remains quite good. Her back is at the higher end of medium, right about 49%. Unfortunately, she doesn’t get any added longitudinal strength from her withers or from her ribcage. We might also expect her to struggle a bit with lateral flexibility through her torso with that shorter ribcage and longer loin. The loin also lacks depth (perhaps broadness too) and therefore strength. This combination of traits adds difficulty to training and riding. The yellow line represents the spine, and as we can see Flecha is downhill built. Note as well where the yellow line crosses the scapula line…just above 50% (around 52%) indicating that Flecha also has a low/medium low set neck (though structured well, which is a big plus). These two traits are the ones that are going to present the biggest training and riding challenge in terms of the question posed to us. Flecha will have to work harder to shift weight to her haunch and engage. Lifting her base of neck will also require more strength from her scalenus muscle than if she had a higher set neck. One other thing going on in this photo is that Flecha is standing with her front feet too far underneath her and thus is ‘leaning over her point of shoulder’. This adds to the ‘downhill’ effect and also serves to close her shoulder angle. This is not a ‘normal’ or ‘proper’ way for a horse to stand and if this is something that she does regularly, then there’s a deeper, bigger problem. For starters, I don’t believe her front feet are balanced and are in part contributing to the stance. I also note that her back is too tight and lacks fullness, but then her abdominals lack strength and her loin lacks depth…all indicating that Flecha doesn’t move with much engagement – ever, but rather travels hollow on a regular basis. When I consider her as a whole, the potential to move better (more correctly) and the potential to reach the set goals is definitely there, but it’s going to require a conscience (and consistent) effort on the part of Haley. That she’s put herself out there and is asking the questions, tells me that the chance of success is very high. Haley seems to have a really good grasp of what she needs to do as a rider and I think just the few changes that she’s already mentioned upon viewing her video will definitely make Flecha a happier camper. The hands, currently, while quiet are too quiet. They need to follow the horse’s mouth. Yes, they are too low and yes, they are often uneven, but it’s mostly that they are ‘dead’ that is annoying Flecha. Haley’s instructor should immediately insist on a hand correction. On her own, Haley should walk her horse with her eyes closed, feel the motion of Flecha’s mouth in her hand and follow it. Tying a couple of pieces of baler twine/ribbon in Flecha’s mane, Haley could grip a piece in each baby finger to help her regulate the unevenness of her hands. Ultimately, she needs to ‘memorize’ a new feeling, which at first will feel wrong and awkward, and it needs to be done right off. Additionally, riding from her core will correct the shoulder and hip issues. Again, her instructor can physically position her correctly so that Haley can memorize a new body feel. In some of my initial conversation with Haley, she was happy with her ride and Flecha’s response at 5:23-5:38 of the video feeling it represented ‘acceptance of contact’. I disagreed and offered that the only time Flecha ever sought contact was at 3:30-3:32, and that what happened later was just Flecha finding a combination of bracing and evasion that gave her a break. I noted that for most of those 15 seconds Flecha tilted her head, which is an evasion. She’s also taking itty bitty steps behind and the canter depart from the forehand at 5:39 clearly indicates that what was happening before it was incorrect. So here’s my advice: Back up. Neither horse nor rider is quite ready for ‘contact’. Before all else we must have ‘forward’. There are multiple times in the video where there is a distinct lack of forwardness. Once that is established then we need rhythm and relaxation, followed by suppleness. It isn’t until we have all of that, that we can have ‘acceptance of contact’. And here’s the next thing that needs to happen; the rider needs to wait for the horse to indicate that she can take up the reins by ‘seeking’ contact – that is; stretching the topline, swinging freely and regularly through the back, lifting the base of neck and telescoping it, opening the throat, and physically and psychologically ‘looking for’, ‘wanting’, ‘seeking’ the support of the rider’s hand. Only then should the rider pick up the rein and shorten it to the length which the horse indicates. It is in that moment that you have ‘acceptance of contact’. When a rider ‘takes’ rein before a horse ‘seeks’ contact, or takes up more rein than a horse has to give, the horse responds by inverting then shortening its frame, followed by either bracing against the unwanted hand or twisting to evade it. So, how do you get to that point? Haley needs to incorporate more transitions in her riding and at this point I’d particularly have her doing transitions within gaits and playing around with forwardness; shortening and lengthening the gaits while maintaining forwardness and without speeding up or slowing down. Certainly she needs to do more transitions between the gaits, but I think within the gaits serves her and Flecha better in this moment. Haley needs to learn about preparing Flecha better for gait changes and so transitions within the gaits teaches her the nuances of aids and communicating. She can build on that and move onto transitions between gaits. I also want to see Haley change direction more frequently and alter her circle size. I’m not suggesting she do a volte, but playing with 15-20m circles would be beneficial, as well, adding some subtle spiraling in and out paying particular attention to the inside leg to outside hand. Haley should be able to drop her inside rein at any given time and Flecha should remain on the circle. The use of groundpoles and cavelletti consistently at this stage would also be beneficial. It can act as a way to get Flecha to look down, thus causing her to stretch. It also increases joint articulation that Haley can use to encourage a more engaged step from Flecha. I also thought that Haley should praise more during her ride. Identify behaviors she wants Flecha to repeat and make sure that she offers positive reinforcement in those moments so that Flecha is more apt to try again and to try harder. Some more spirited conversation between the two would be nice to see. There are several other options that can be implemented to progress horse and rider that I’m sure others will suggest. This is a pleasant horse/rider combination. They have accomplished much as a team and are close to having a major breakthrough that will propel them to the next level.